Reed diffusers are now being used to bring the benefits of aromatherapy into our homes. An Aromatherapy Diffuser brings so much more than a pleasant scent to our rooms, it can be used to create ambiance, to lift our mood, to help set a romantic scene and to promote health and wellness. Using a diffuser is a very safe method of fragrancing your home. The essential oil works naturally up the reed and is diffused into the air without the need to heat the oil with a flame. This also gives them an advantage over scented candles which could pose a fire hazard if proper care is not taken. It also means that no soot from a flame or any other toxin resulting from burning is released into the atmosphere of your home. Our sense of smell is powerful at evoking memories of events and places from our past, it affects the way we feel and this has been proven in the case of people who due to a medical condition or accident have lost their sense of smell who often feel depressed or anxious because they have lost a sense which enables us to enjoy the richness of the environment around us. Imagine not being able to smell fresh coffee or enjoy the perfume of a rose. Aromatherapy brings many health benefits and can be used to create an ambiance or mood. An Aromatherapy diffuser can safely be used by almost everyone. Although aromatherapy treatment with some essential oils is not suitable during pregnancy (some are not suitable for massage, for example), most people agree that relaxing fragrance has positive health benefits. If you have any concerns about your own health, you should consult your doctor before trying any form of aromatherapy. An aromatherapy diffuser is an inexpensive way to create a subtle mood or a distinct fragrance if you choose your essential oils and perhaps use a decorative jar you already own and purchase reed diffuser sticks separately. 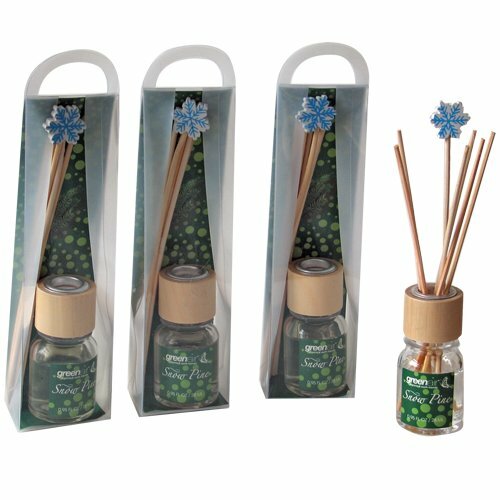 If you purchase a ready-made product, reed diffuser refills are widely available and make these very cost-effective too.